Two Bears Farm and the Three Cubs: Tulley is back! Our Elf on the Shelf, Tulley, has returned for the third year in a row. The boys were very excited to see him. Every night, he flies to Santa to report on the boys' behavior. And each morning he shows up in a new spot in the house. Unless he forgets to change spots (ahem). What about you, readers? Any fun holiday traditions that return year after year? We are starting the Elf on the Shelf this year, but we are waiting until December 1st to start. This year the kids are also making their own advent calendars. They are decorating little brown paper bags, and then I am going to put a verse in each one and a little treat. It is keeping them extremely occupied which is nice! Nothing like saying "here are 24 bags, decorate them!" and letting them go to town! The other big tradition we have is an open house on Christmas Eve for anyone that wants to come. The kids decorate cookies, and we listen to Christmas music and watch the Polar Express. Fun times! We had the pickle hidden in the tree. Whoever found it got the extra treat.. usually an unusual candy treat. I bet they love looking for him! You must have SO much fun figuring out where Tulley is each day! I had never heard of Elf on a Shelf until this very morning, when a co-worker talked about her daughter's Elf. I think it's a fun idea. That is so fun! I wish I had thought of that when my 3 were little. This is a great one! I can't think of any similar traditions we had, but I remember starting some we couldn't maintain when the kids were small. Oops! We learned to keep it simple! I need Tully to spy on Kona and Willow! They've been very naughty! I remember your posts on this from last year. I hope you show us his travels from time to time. 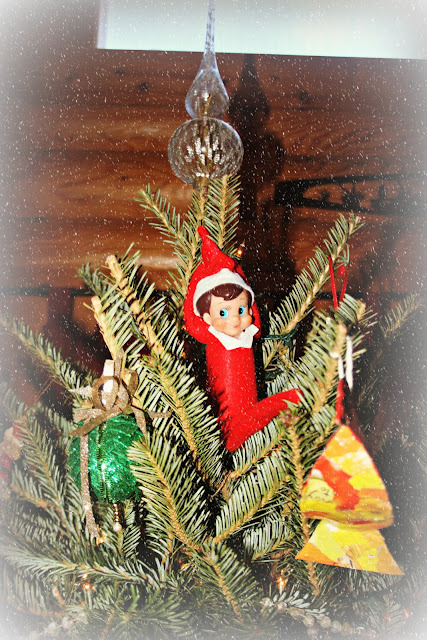 Our son sets up their elf to get into some kind of trouble every night. One night he was sitting by the coffee bean canister, he had gotten into the beans and spilled them all over the counter. But trying to think up something every night would make my brain explode. LOVE the candy hoarding picture, it is the definition of childhood. I would frame it and put it somewhere. We read a Christmas book every night. 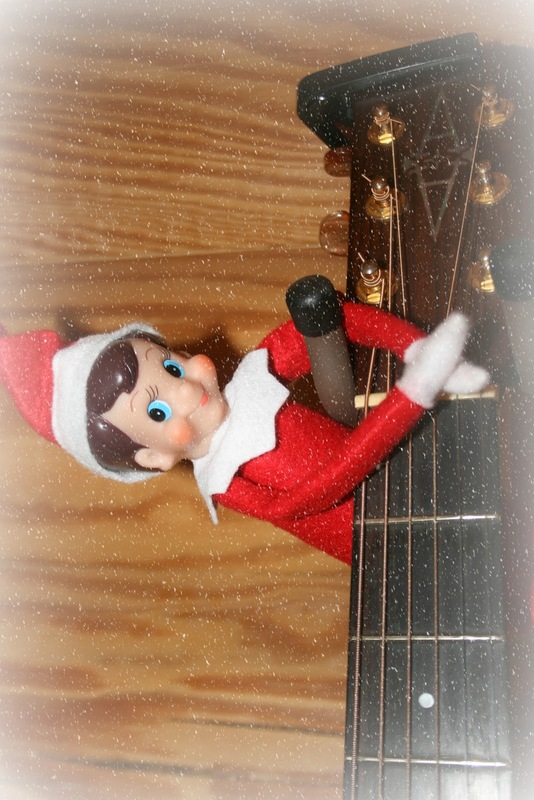 I like the elf on the shelf idea. We've just never done it. In fact we had one when we were kids. He just stayed in the same spot always. I don't think my mom knew what to do with him. when my kids were young we always decorated the tree together to the Disney Christmas Carol cassette tape. To this day my daughters always have to play Disney music in some form or another while they decorate the tree. Your tradition is so cool. I love it. To be young and have neat little things like Tulley! Also we had one of those clear plastic trees that you put gummies on the branches - that was another favorite! I'm hoping Santa will drop off an elf this year while we are back in the States. Other than that - we are big on the advent calendars around here! I love them. How neat!!!! I love traditions like that... Even OLD PEOPLE like GE and me have traditions... It's just so special... AND---we have memories to share forever!!!! Love Tulley.... AND--I'm sure the boys will be extra good now that Tulley is watching for Santa. your kids must be so excited! I bet you have as much fun with him as the kids do. LOL.